Yamaha had only been making motorcycles for five years when it decided to go into scooters, an already overcrowded market sector in Japan. The SC1, launched in March 1960, was lavishly equipped; while the engine was certainly derived from that of the 1956 YC1 (but mounted longitudinally and with forced-air cooling), the rest of the bike was remarkably innovative. Its styling was particularly successful - streamlined, youthful and rational. Yamaha invested heavily in the SC1, which used a transmission incorporating a real hydraulic torque converter mounted on the end of the crankshaft, a two-speed automatic gearbox, and shaft final drive. Producing the pressed-steel chassis/body called for complex tools, and the suspension - with single swinging arms front and rear - stood out from the normal run of scooters, as did the ten-inch wheels, which gave greater stability than the usual eight-inch wheels. Priced at 150,000 yen, the SCl was not expensive compared with the rival Silver Pigeon, which was heavier, less powerful and less elegant, but cost 175,000 yen. Sadly, the SCl was not only extremely difficult to produce, but its reliability was extremely uncertain. It cost Yamaha a great deal; though it was only in production a short while, it seriously imperiled the financial health of the young venturer. 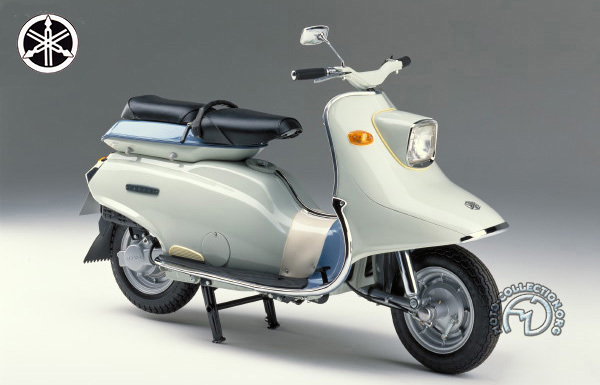 Yamaha 's first scooter was such a disaster that the company didn 't venture into the scooter market again until1977.